When the waitress looks at the image in the obituary, she’s talking about Maurice Russell, but for all intent and purposes, she might as well be talking about Peter O’Toole. In some ways, they’re one in the same. He certainly was a ruggedly handsome young man with piercing blue eyes. Certainly capable and epic enough to play the inscrutable title character in Lawrence of Arabia. But his life had as much turmoil as it did success. O’Toole in his present incarnation looks wrinkled, perpetually tired, and dare I say, somewhat decrepit. It’s not just the fact that he is so many years older, but his life was a hard one involving heavy drinking and many related health issues. In many ways, it was a miracle he was still alive, but the fact is he persevered and gave us Venus. I must admit the idea of Venus intrigued me perhaps more than the actual film. Here we have O’Toole, arguably one of the greatest actors ever to come out of the British Isles, playing a version of himself well into his 70s. The opportunities abound for reminiscing and deep soul searching as he looks back at the life he has led. Pair him with another British star like Leslie Phillips and the chance for fun little moments between two old pros seems all the more likely. 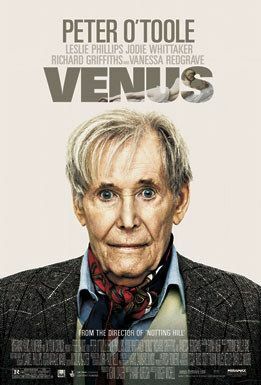 And Venus is a bit like this; certainly boasting moments of immense depth of character, sadness, and emotional sequences. However, I had some trouble parsing through the other side of aging star Maurice Russell (O’Toole). In many ways, he just looks like a dirty old man. The assumptions begin when he begins to make small talk with Ian’s (Phillips) grandniece Jessie (Jodie Whittaker), who isn’t too keen on living with her great uncle. But a sort of dysfunctional friendship forms thereafter. Maurice gets immense vigor out of spending time around Jessie, who he encourages to model, buys clothes for, and takes out for drinks. But as he deals with his illnesses and ailments, he also seems to have a deep desire to be close to her, bequeathing her the name Venus, the goddess of love, after taking her to his favorite piece in the National Gallery. However, this symbiotic relationship that they build at times feels excruciatingly uncomfortable and it turns destructive more than once as they have one falling out after another. If you put aside a few scenes of awkwardness — Venus really does have goodness to offer — you just have to be patient. In fact, perhaps Maurice is not dirty-minded but is greatly enraptured by beauty. He notes the most beautiful thing a mortal man can ever see is a woman’s body. But when asked about the woman’s perspective, he candidly replies that their first child is the most beautiful thing they could ever imagine. I am quickly reminded of the moment where the two old-timers begin to wander the halls of the church acknowledging plaques inscribed with the names of Boris Karloff, Robert Shaw, Laurence Harvey, and Richard Beckinsdale among others. They must come to terms with the fact that someday they too will be up there, but for right now they resign themselves to dancing joyously together. There’s another moment when Maurice drops in on his ex-wife played by a genial Vanessa Redgrave, who has long forgiven him for the hell he put her through. Now as the years have gone by, they have become friends once more, and there is an earnestness in Maurice because he knows he might not be around much longer. Finally, the film comes full circle returning to the tranquil shores in Kent, where it all began, and Maurice is reconciled with Jessie as he feels the water between his toes one last time. His work here is done. R.I.P. Peter O’Toole. You were a true romantic of Shakespearian stature. This entry was posted in 2000s, British, Comedy, Drama and tagged Peter O'Toole, Review by 4StarFilmFan. Bookmark the permalink. Very glad to hear it! It wasn’t quite what I first expected but it still ended up being a meaningful film in many ways.